One of the interesting trendlines in this week’s edition of our regular #TrendlineWednesday feature on Twitter comes from the chart of the MSCI EAFE Index (EAFE). As a reminder, the EAFE Index represents developed countries in Europe, Australasia and the Far East. Like most equity markets around the globe, the EAFE has enjoyed a strong up-move of late, particularly over the past 2 years. The index did hit a snag, though, along with most stocks, early this year in the form of a post-January correction. And the resulting action has the EAFE testing an important line of bull market support. Specifically, the EAFE is testing the Up trendline stemming from its Brexit lows and connecting the post-U.S. election lows and the lows from this past March-April. As the chart indicates, the “test” level – near 2023 – also happens to signify the approximate convergence level of both the 50 and 200-Day Simple Moving Averages. 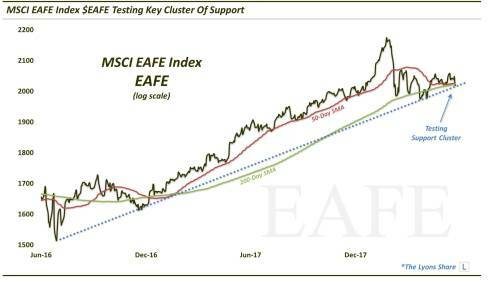 Obviously, if the EAFE wants to maintain the direction and pace of its current advance, it would behoove the index to hold this key cluster of support. 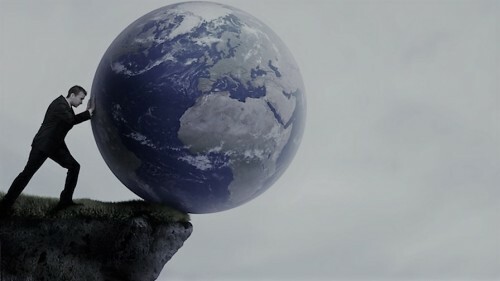 So keep an eye on the approximate 2023 level on the EAFE for a “tell” on the future direction of the global developed market equity rally. Do we think the EAFE will pass this test? And how much risk opens up should the support area give way? In a Premium Post at The Lyons Share, we share our analysis of the EAFE’s prospects, as well as the clearly defined potential downside and upside targets.